How to Transfer Android Photos to Android? Developers have come up with apps that run on majority of Android smartphones and tablets that enable the users to edit photos in different ways. For example there are apps that enable the users to add different backgrounds to photos available in the devices. The backgrounds can be used to bring out laughter, fun or adventure. Other apps allow users to edit the photos by changing a few settings such as fading the photo, changing it’s brightness or even adding a few effects. When your friend who uses an Android phone and have recently purchased a great photo editing app, you must have the desire to transfer your favorite photos to him and let him edit the transferred photos with his photo editing app so that you don't have to buy the app separately. But how to transfer photos from one Android to another Android? You need to use third-party software like Coolmuster Mobile Transfer or Coolmuster Mobile Transfer for Mac. Third party applications are designed, developed and tested to work with different brands of smartphones currently available in the market. This enables the users to use one single application to transfer different file types between their smart devices. The application is compatible with popular smartphone brands which include the iPhone, iPad, iPod touch, Samsung, HTC, LG, Sony, Huawei, ZTE, etc. that are running iOS and Android.The compatibility with different devices that run different operating systems allow the user the ease of exporting photos and other forms of information, such as music, apps, contacts, SMS, videos call logs, apps, etc. with ease. All this process is possible to be completed through one click. The app has been tested thoroughly therefore it is safe for use and risk free. All content that is transferred between devices remains one and the same as the original. Launch Coolmuster Mobile Transfer application and you will see its primary interface like the picture below. You are required to connect your two mobile phones to the computer via USB cables. Supported Android brands: Samsung, HTC, LG, Sony, Motorola, Google, Huawei, ZTE, etc. After the connection, the two Android phones will be detected and displayed side by side. All the transferable files are displayed in the middle. The data will consist of contacts, photos and messages among others. Select "Photos" only and preview all contained images in the below. Mark those pictures that you need by ticking off the checkbox. Now, you are ready for the transfer. Just click on the "Start Copy" button to kick off the photos transfer from one Android to another. Note: Be sure that the two Android phones/tablets are well connected during the whole transferring process. I think many Coolmuster fans own our star product - Coolmuster Android Assistant or Android Assistant for Mac. Most users treat it as an Android data managing program, since it can help you transfer Android data, including contacts, SMS, photos, videos, music, apps and more to computer for backup, and import these files from computer to Android phone. But few people know that Android Assistant also can be used as phone data transfer tool to transfer data from one Android phone to another one. All what you need is two USB cables, two Android phones, a computer and our Coolmuster Android Assistant. 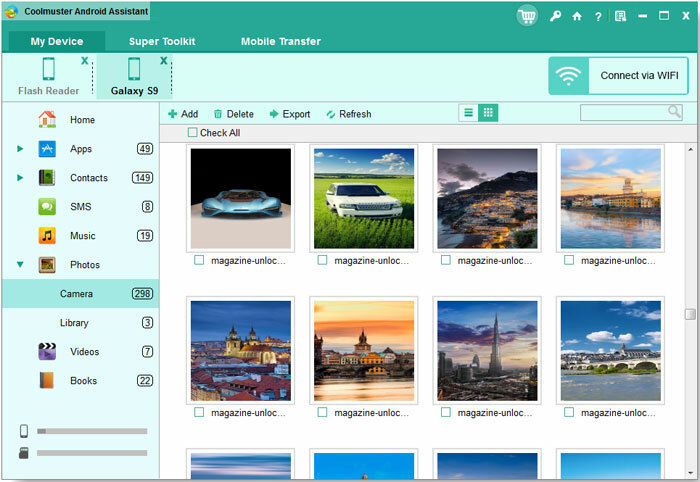 Download the free trial of Android Assistant and then follow the guide on how to use this program to transfer photos from one Android device to another Android phone/tablet. 1: Launch Android Assistant after you download and install it on your computer. 2: Plug your two Android devices to the same computer via two USB cords. 3: Navigate to the source Android phone and choose "Photos" from left sidebar. 4. Preview and select the photos you want to transfer and click "Export" button from top menu. 5. Choose a location on your computer to save the exported photos. 6. Navigate to the destinated Android phone and choose "Photos" from left sidebar. 7. Click "Import" button from top menu, browse for the exported photos and import them to your destinated phone.